When you order a coffee, you know just the way you want it. When you’re looking for a handyman, you know just the job you need done. And when it comes to getting the updates on your team’s sales activity, you are the best person to decide what metrics matter most to you and need to be included in the report. With Custom Reports, you can generate, save and email the summary of your team’s progress on the sales activity that is most relevant to your business goals. Your team’s Activity is the beating heart of your sales process. Every update, every action is logged there, giving you an overview of everything that you and your team are working on. You can zoom in on the specific activity of a team member (i.e. see whether or not Jack has closed any deals recently) or decide to just check the overall flow of your processes. What if you want to know how many deals Jack closes every month, or how many calls he logs a week? 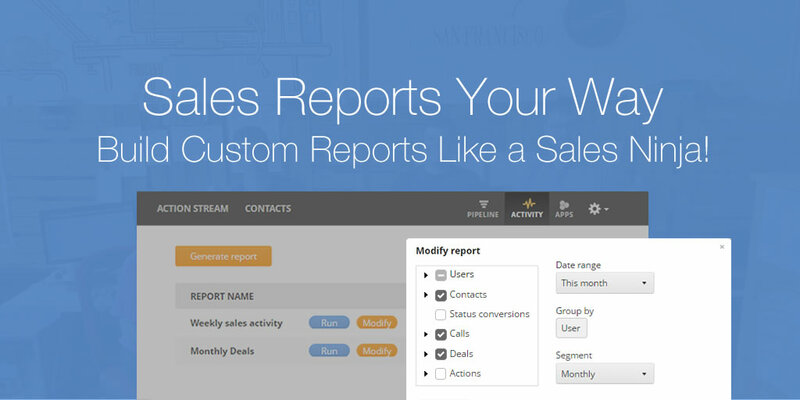 Introducing our new Custom Reports. Yes, we could have offered you a preset of fixed report templates. Yes, we could have tried to predict what report you will need most often. But we didn’t. Instead, we decided to give you the power to pick and choose the metrics and KPIs that make the most sense for your business and sales progress. We genuinely believe that you know best what you need. Custom Reports are made to be flexible and reflect the information that you find most relevant. 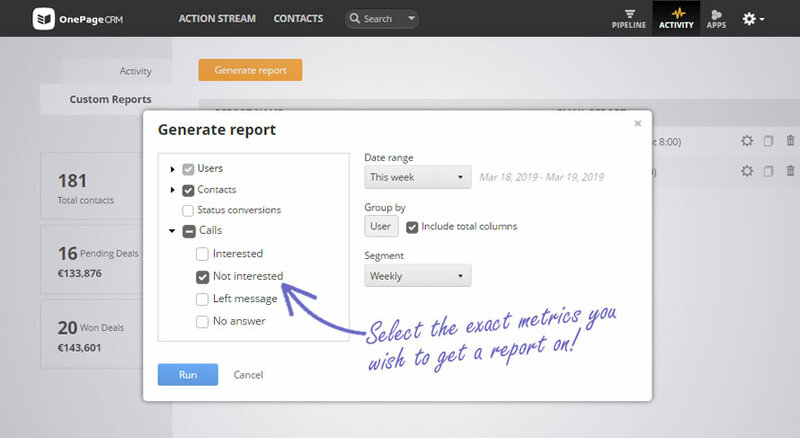 To generate a report, switch to the Reports tab in your Activity, click ‘Generate Report’ in the top left corner, select the sales activity you want an update on and the corresponding date range and click ‘Run’. You can go as detailed as you like. In just a couple of clicks, you can check how many calls Jill made last quarter were marked as ‘not interested’ or better still ‘interested’. While you can run a one-time report to get an instant zoom-in on a particular aspect of your sales process, the real strength of Custom Reports is in their continuity. Once you have selected the metrics that matters most to you, you can choose for it to be regularly emailed to you or anyone else on your team. After you have generated the report, click ‘Save’ in the upper right corner and select ‘Email this report’ in the appeared pop-up. Set your preferred time, date range and format and hit ‘Save’. So, let’s say you would like to get weekly updates on the won, lost and created deals from Jill and Jack on your team. You have team meetings every Monday afternoon and having this data will make your life much easier. 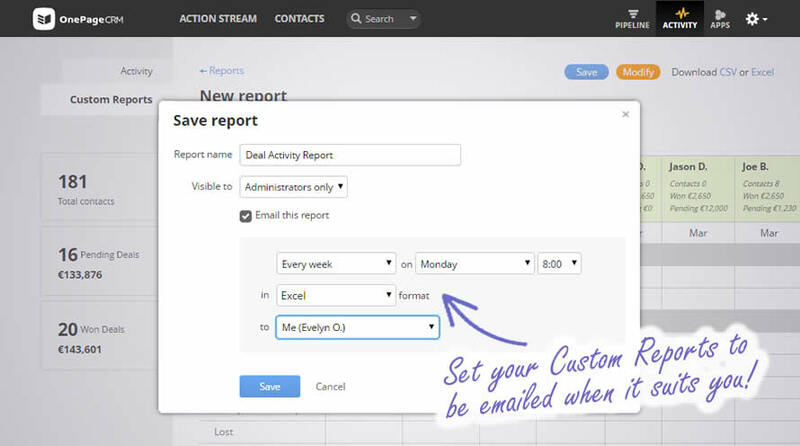 Generate your custom report and set your email preferences to every week > Monday >8:00. This way, you will have enough time to review the numbers and plan your next steps. In the format line, you can choose between CSV and Excel. The latter can come in particularly handy if you need to include the generated numbers in a bigger report. Sometimes you need to have a closer look at a particular metric or a progress of a team member. We have you covered — you can generate as many reports as you need. You can also modify the reports right there and then, until you get the data slice you want. You can save up to 3 reports for which you would like to get regular updates. For example, you want to track the deals won each quarter, the monthly progress of your team’s logged calls and the amount of contacts Jill adds each week. The great thing is you can set up different email preferences for each report, making sure you get your updates right when you need them. If you need to generate a report that differs only slightly from the existing one (for example, you would like to get that contact report for Jack instead of Jill), just hit ‘Clone’ to the right of the report and save yourself the fuss. Who said Custom Reports were made for management only? 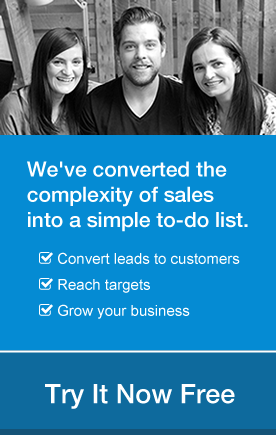 They are a brilliant way to keep yourself on sales track and check your progress. Falling behind on your targets? It’s time for a big push. Almost reached your goal? Well, we always choose overachievement here at OnePageCRM. As for sales managers, Custom Reports can also help you keep an on-going track of your team’s performance. You don’t have to wait for the end of month/quarter/year review to check on the progress! You can always see how a particular team member is performing compared to the rest of the team and offer support and an extra motivation if needed. Custom Reports can also help you with sales forecasting. Instead of waiting for that sales review, you can check on the immediate progress and take the appropriate measures to ensure your team reaches the targets. Custom Reports give you the freedom to choose what updates matter most to you and get them regularly delivered to your inbox. Whether you want to keep an eye on your team’s progress, get your numbers straight for a board members meeting or just keep yourself on sales track, Custom Reports will save you precious time and, as all that we do at OnePageCRM, reduce your admin work to zero. Writer and Marketing Executive at OnePageCRM. Nomad by choice, word crafting addict and all-night lindy hop dancer.